A Great Bustard shows off to a group of females by inflating special neck sacs – producing what sounds like a massive sneeze followed by a Bronx cheer. He flips his wings almost upside down to reveal bright white undersides, while fanning his tail and long, white throat whiskers. Three feet tall and weighing as much as forty pounds, a Great Bustard appears to walk with self-conscious dignity on long thick legs, like an Ostrich or Emu. Bustards are found in open landscapes across southern Europe, Africa, Asia, and Australia, where that impressive mating display can be seen and heard. A Great Bustard, the heavyweight champion of all European birds, is showing off to a group of females, strutting his stuff across an open field. The stylish male Great Bustard is feathered in gold and russet brown. In a display that rivals our own sage-grouse, he sounds off by inflating special neck sacs – producing what sounds like a massive sneeze followed by a Bronx cheer. Simultaneously, he flips his wings almost upside down to reveal bright white undersides, while fanning his tail and long, white throat whiskers. Great Bustards are imposing birds – three feet tall and weighing up to forty pounds. They appear to walk with self-conscious dignity — head held high and with a confident stride on long, thick legs — reminiscent of an Ostrich or Emu. Unlike those two, however, the bustard is a strong flyer — rising into the air with powerful wing strokes. Mostly, though, they prefer to walk. Their heritage dates back more than 70 million years. 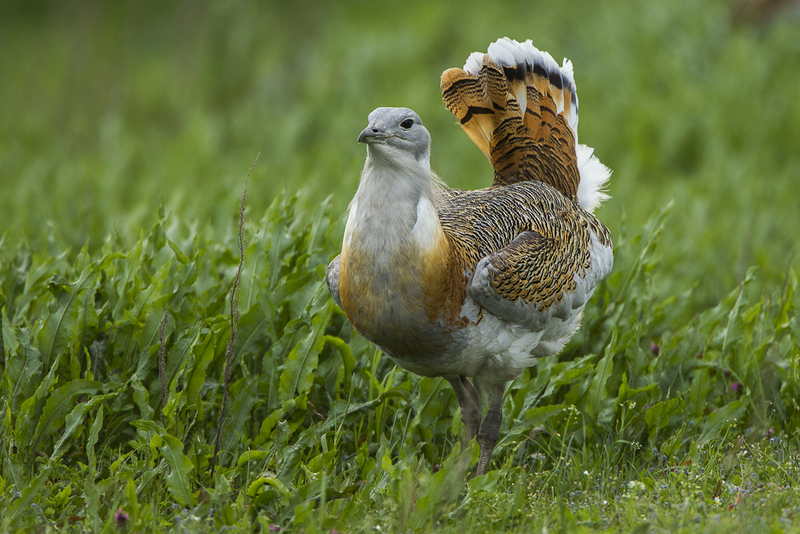 Today, bustards, 26 species in all, are found in open landscapes across southern Europe, Africa, Asia and Australia. Habitats where that impressive mating display can be heard— and seen — by females looking for a mate.